The RBA left the cash rate on hold in September at 1.50% after cutting in May and August. RBA Governor Stevens elected to leave the outlook open in his final accompanying statement. The FOMC appears to be getting closer to a rate hike and the market is reacting. 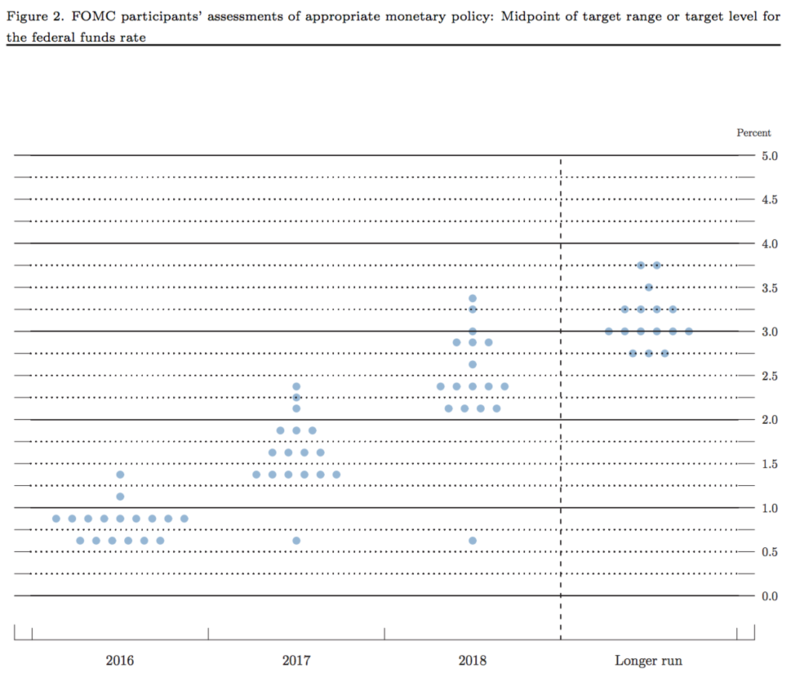 The time has now come for the FOMC to walk the walk when they meet next week. 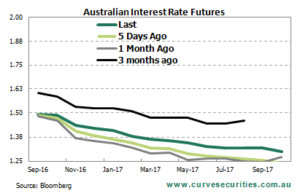 The RBA left the cash rate on hold in September after lowering it in at both the May and August meetings. In his last time as Governor, Glenn Stevens accompanying statement gave little away as far as the outlook for interest rates is concerned. The outlook suggests that the RBA has a mild easing bias but much depends on what happens offshore. Ongoing rhetoric from Fed members suggests we are getting closer to the next rate hike. The market seems to agree with bonds selling off in recent days and equities markets getting the jitters at the prospect of higher rates. As such the market will be keenly awaiting the result of next weeks FOMC meeting. In one weeks time, the members of the Federal Open Market Committee will begin their two day meeting to discuss monetary policy. While much will be said throughout the meeting, it is hard to see how any information received between then and their previous meeting has changed the situation they are currently facing. Nevertheless they will ultimately discuss whether or not it is appropriate to make an adjustment to the current calibration of monetary policy. Whichever way you want to look at it, it is very hard to assimilate the current state of the US economy with the current level of monetary policy. The unemployment rate suggests that they are getting close to full employment. 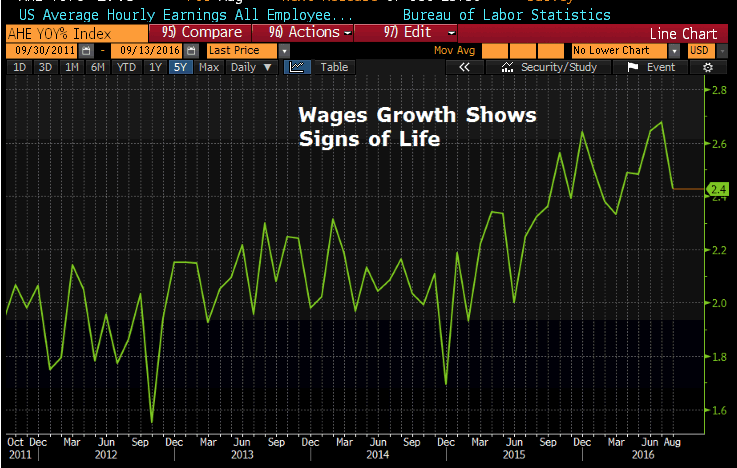 It is true that it has a lot to do with the millions that have left the workforce and have given up looking for work but the reality is that the jobs market in the US is now tight enough to be putting upward pressure on wages. 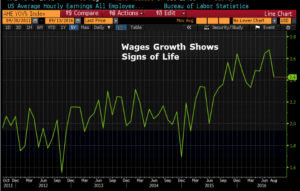 While most measures of inflation aren’t quite at their target, any pick up in wage inflation will eventually filter through to broader inflationary pressures. The one thing that appears to be holding the FOMC back is fear. When they hiked rates back in December last year, there was a significant fallout. 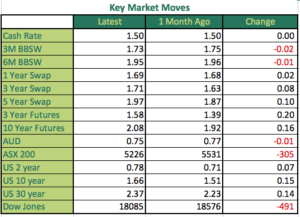 Despite the move being flagged well in advance by individual Fed members and in the official FOMC statement, the market still threw a pretty big tantrum. At the time though, there were a number of other elements at play which added fuel to the fire. One of those being the collapse in the price of oil which had its own ramifications. This time around however, the oil price is already low, even if it is well off its lows from earlier this year. The Brexit is also now behind us. The market has also had ample warning. I can’t remember a period of time over the past decade where there have been so many Fed members speaking publicly. It could just be that every word that has been spoken has been far more closely scrutinised than has been the case in the past. The message from each of the speakers, including the official Fed communiques such as Janet Yellen’s Jackson Hole speech, is that higher rates are coming. Sure, there is still debate about the timing and trajectory of higher rates, but they are coming. The need to act is now. I highlighted two weeks ago in the Daily Commentary post titled: Just Get On With It, that the time has come for higher rates. 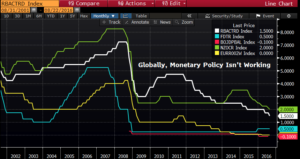 The fact is that current monetary strategies being employed by central banks where rates are very low, in some cases negative, and huge amounts of cash are being pumped into financial markets through Quantitative Easing aren’t working. Any benefits from a ‘wealth effect’ from the pumping up of asset markets, where the benefits of which have been mostly for those already wealthy, are being offset but the fact is that savers have to save ever more to reach their goal due to low rates. Above all, we must remember that like currencies, interest rates, or the price of money, is all about relativities. As the price of the world’s reserve currency was set ever low as the FOMC cut rates to zero and they engaged in Quantitative Easing, others had to follow them to maintain relativities. You only need to look at what the RBA has had to do to drive the currency lower. In what world does a country need a 1.50% cash rate when it has annual growth above 3.00% and hasn’t had a recession for 25 years! 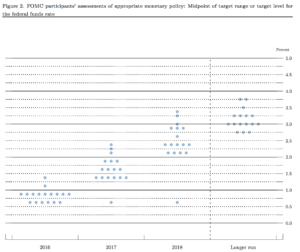 Once the FOMC starts to go and keeps going, the rest of the world will be able to follow. Savers will make more on their savings and consumption will finally be able to come to the fore and drive the global economy once more. It really is an interesting time to commentate on the RBA and the outlook for monetary policy. There are a number of challenges that face the RBA at a time where we are about to see the first leadership change in a decade, as Governor Glenn Stevens hands over the reigns to his long time deputy Phillip Lowe. 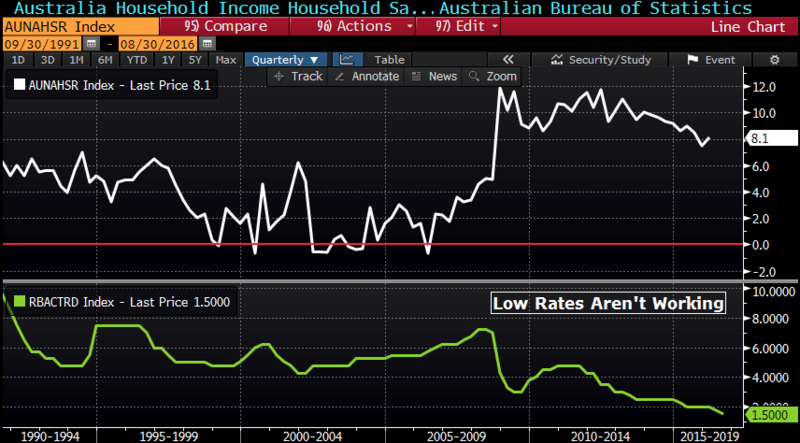 Australia’s current monetary policy setting, which sees the cash rate at an all time low of 1.5% is incongruent with an economy where growth has been chugging along at a resectable 3.00% for a number of quarters. In fact, if the economy continues to grow for another year without two quarters of negative growth, Australia will claim the world record for the longest period of uninterrupted growth (current holders are the Netherlands with 103 quarters). The growth statistics however mask an economy that is grappling to transition away from mining led growth and low rates just might be exasperating the problem. Up until the most recent quarter, net exports had been propping up growth, which would have otherwise been struggling to break even. During the latest quarter it was government spending which was the main driver of growth, something that should be expected with the broader economy under pressure and investment remaining low. 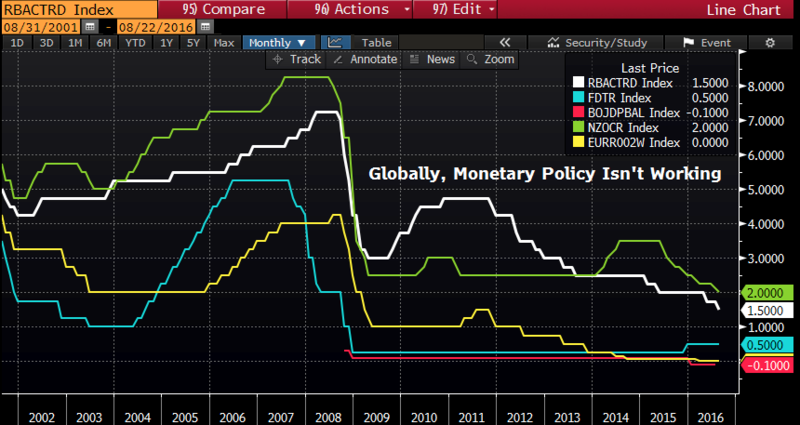 The other challenge is the external environment and how that effects the calibration of monetary policy. While the cash rate is the most commonly known contributor to overall monetary policy conditions, the level of the currency goes a long way to determining whether monetary policy is accommodative or not. This is where the concept of relativities as I mentioned above comes into play. It is also why the outcome of the FOMC’s monetary policy decision, both next week and in December, are so important. The developments over the past few weeks. We continue to see strong rhetoric from numerous Fed speakers on the prospects for a near term hike while there are signs that the ECB and BoJ are done for the time being as far as stimulus is concerned. This has resulted in bond markets backing up, driving yields higher while equities look shaky. Most importantly it saw the AUD knocked back towards 0.75. 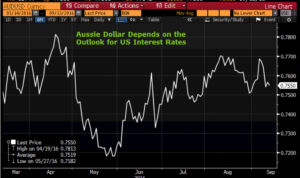 Should the FOMC finally pull the trigger and indicate there is more to come, the AUD could head much lower. 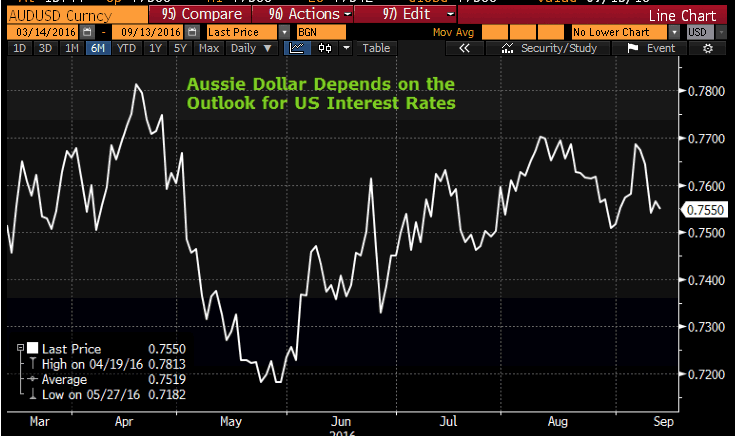 The biggest gripe the RBA has had in recent times is that the AUD has remained ‘unusually’ high. This could be the least of their concerns if the FOMC walks the walk after talking tough. The market still suggests the RBA has an easing bias. 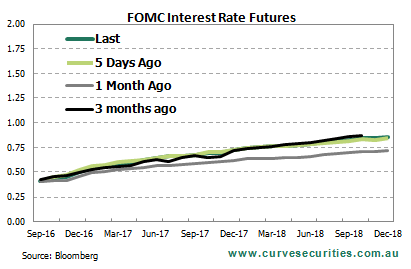 I would argue that if the FOMC is serious and starts to get on with it, we have seen the low point in interest rates. 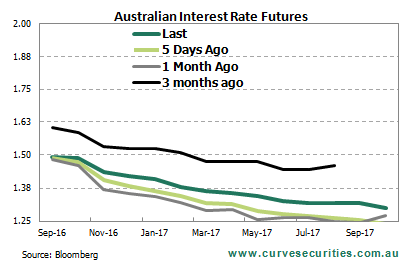 It would mean that at some point the RBA would eventually need to follow the FOMC high to stop the currency from falling too low. If the FOMC false starts yet again then all bets are off and we could be heading lower. It all sets the scene for a very interesting run into the end of the year. Strong headline employment data was recorded in August with total employment growth of 26,200 jobs. However there was another big swing towards part-time employment with full time employment falling by around 45,000 positions and part-time positions increasing by 71,000 positions. The headline job growth did not change the unemployment rate which remained unchanged at 5.7%. ANZ job ads remained volatile once again in August with a decline of 0.8%, after July’s reading recorded an increase of just under half a per cent. NAB business conditions index fell in August with further concerns of soft profitability and trading conditions. Business confidence actually rose in August, from 7 to 9 to be running close to the long run average. The Employment index remained unchanged at 4. Consumer confidence seems to have responded well to the RBA’s recent rate cuts, posting a modest rise of 2% to put the index just above the key 100 level at 101. Retail sales continued to struggle in August with the 0.1% increase falling short of expectations of a 0.3% increase. Spending on discretionary items has remained subdued from month to month. Housing finance was solid in August. The number of owner-occupier loans were up 1.8% with the value of occupier loans rising 1.2% while investor lending increased 3.2%. Australia’s trade deficit showed signs of deterioration in August. The deficit printed at $3.195 billion which was worse then the previous reading of $2.2 billion and far worse than the $2 billion deficit expected by the market. Building approvals went backwards in August, after expectations of a 0.8% increase was replaced by a substantial -2.9% retreat for the month. Volatility in motor vehicle sales continued in August with total sales down 1.3%, from the previous gain of 3.1% in July. Despite the fall in sales, total sales remain higher than a year ago. Hold Your Horses What Has Changed?